How great be if we could all hang out in my kitchen and you could taste the recipes I post here in person? It’s one of my fondest wishes, especially when I’m making bold, borderline-suspect claims…like the fact that today’s Beet Smoothie recipe is completely delicious, and you should try it even if you don’t like beets. A sip! Just a sip. Pretend we are in the kitchen together, and I’m offering it to you. You’ll be a Beet Smoothie believer too, I can feel it. 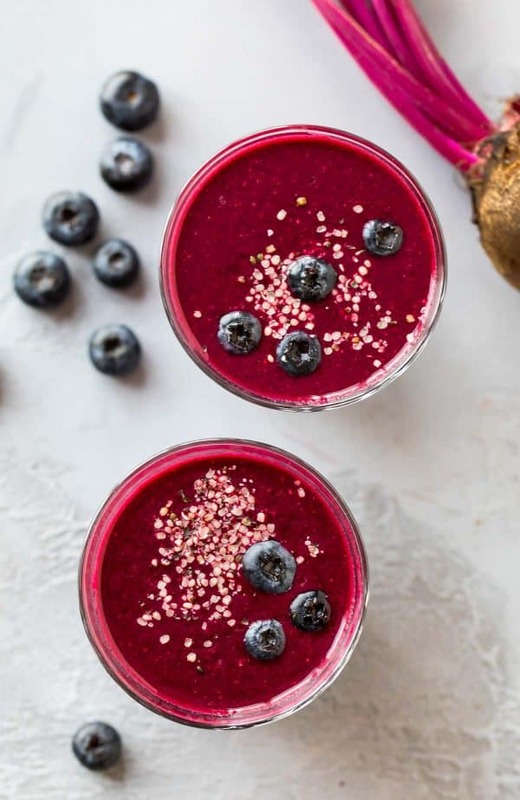 Since I don’t have this luxury, I’m going to call on our virtual circle of trust and assure you that this Beet Smoothie is creamy, sweet, and scrumptious. Like their cousins sweet potatoes and carrots, beets have a natural sweetness that makes them a good choice for dessert and breakfast endeavors. After having success baking with beets to make a Pink Cake (SO YUMMY), a Beet Smoothie felt like the next step. After all, I love this Carrot Smoothie. Why not try something similar with beets? Blueberries. Sweet, fruity, and a delightful pairing with our lovely beets. Pineapple. The magical smoothie fruit. No matter what other, erm, questionable, ingredients you add to a smoothie, pineapple sweetens and smooths their flavor. Need proof? Check out the reviews on this Kale Pineapple Smoothie. Greek Yogurt. Creaminess + filling protein. If you’d like the Beet Smoothie vegan, you can omit it or use a dairy-free yogurt. Honey. 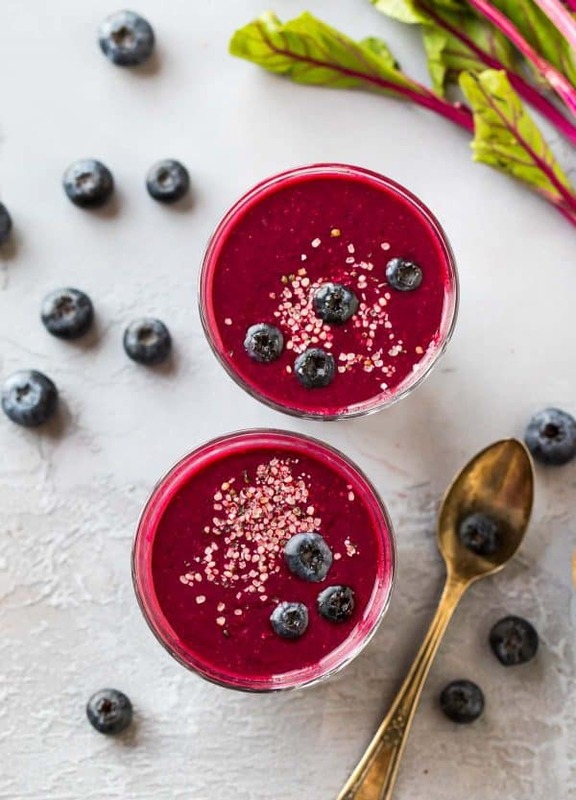 If you are a diehard beet-lover you may be happy without it, but for those who like a sweeter smoothie, feel free to add to taste. 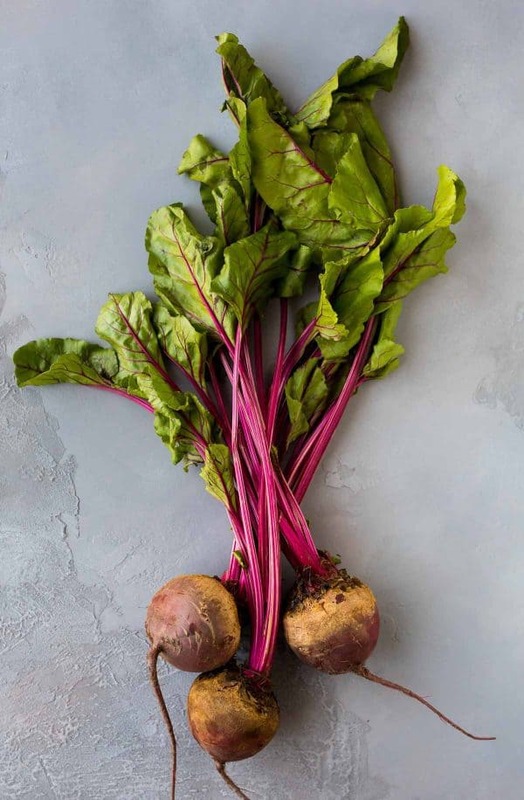 Beets are low in calories and a great source of nutrients, including folate, potassium, vitamin C, and more. Beets may help lower blood pressure. Antioxidant party! 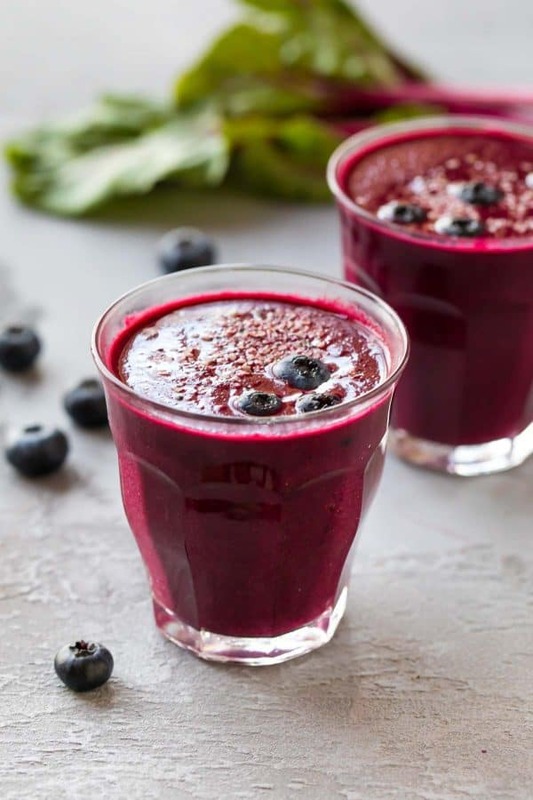 Beets and blueberries are both high in antioxidants, so you are getting a double dose of these super stars. Beet Smoothie detox time. Beets are high in fiber, so this smoothie will keep you satisfied. If you are considering a Beet Smoothie for weightloss, this recipe could be a good option for you. Plus, you are receiving the wonderful benefits of the pineapples and blueberries at the same time (more vitamins! extra nutrients! anti-inflammatory! digestive support!). To make the smoothie as fast as possible to prepare, I developed it as a raw Beet Smoothie recipe, so you don’t need to cook the beets first. I find cutting the beet into a rough dice works fine if you are using a Vitamix or similar high-powered blender. If you are making the Beet Smoothie in a lower-powered, regular blender, I’d suggest chopping the beets more finely and adding them a little at a time. For easy blending guaranteed, you can also make a cooked beet smoothie. Cut the beet into large chunks and steam or lightly boil the pieces until they are tender, then chill them so that your smoothie stays nice and frosty. Cooked beets last several days in the refrigerator, so you can certainly prep a few servings in advance. I haven’t experimented with a canned beet smoothie yet, mostly because I’m not wild about the flavor of canned beets. If you are a fan, you can certainly play around with that route. For the smoothest blending, I recommend a high powered blender like a Vitamix, Blendtec, or KitchenAid Proline. If you do not have a high powered blender, see “A Note on Beet Smoothie Blending” above. Blueberry Beet Smoothie. Sweet, creamy, and packed with fiber, protein, and antioxidants! This healthy breakfast smoothie is perfect for weightloss or for kids. Delicious, fruity, and the beets aren't too strong. Optional mix-ins: chia seeds — hempseed, and/or ground flaxseed (I like mine with a sprinkle of chia or hempseed; hempseed is what you see pictured in the photos); I also like to add 2 tablespoons oatmeal to make the smoothie even more filling. 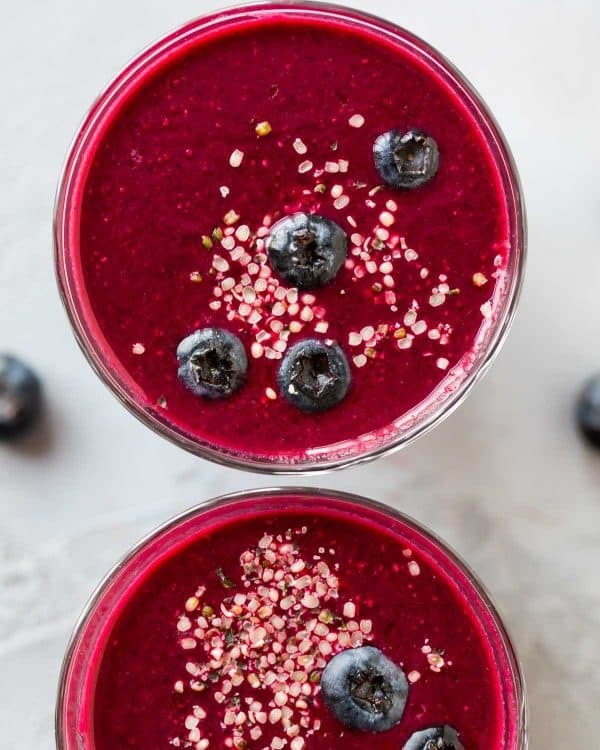 Place the almond milk, blueberries, beet, pineapple, and Greek yogurt in a high speed blender such as a Vitamix (if you do not have a high speed blender, I’d suggest microwaving, roasting, or lightly steaming the beets before using so that they are softer and puree more smoothly). Blend until smooth. Taste and if you desire a sweeter smoothie, add a little honey or date and blend again. Enjoy immediately or refrigerate for up to 1 day. While I wouldn't describe this smoothie as being too "beet-y," you can detect the flavor of the beets. If this is a concern, you can try reducing the amount of the beets and increasing the amount of berries. I like using either all blueberries or a mix of blueberries, raspberries, and blackberries. Adding 2 tablespoons oatmeal also mellows the beet flavor. Thank you so much Kori! The nutrition information is for 2 servings :) I hope that helps! It is SO good for you! Seriously, what can this beet smoothie NOT do for you?! Exactly!! Thanks so much, Gaby! Love that vibrant color! As an RD, I agree with you about the health benefits of beets :) and such a fun and easy way to add in more veggies! The color is truly stunning! Hope you enjoy this smoothie! I’m enjoying this smoothie as I write. It’s surprisingly DELICIOUS! I’m not a picky eater–love veggies–just couldn’t imagine beets in my smoothie:-) I added more almond milk in place of the yogurt and avoided sugar by adding a teaspoon of both vanilla and cinnamon for sweetness. This is going into my smoothie rotation! Hi Lynette! Thank you so much for the positive feedback – I’m thrilled this recipe will be on regular rotation. Your changes sound delicious – I’ll have to try them out! Have a great weekend! I’m definitely not a beet fan, but this smoothie is just too intriguing not to try! I’m hopeful it will convert you into a beet lover ;) Let me know what you think if you try it!! This was a delicious and healthy relief on the hot days we’re getting down here in California, I’ll be trying it without honey on the next batch and see if I’m still in love with it! Thanks for sharing! Sam, YAY! I am so happy to hear how much you enjoyed the recipe. Thanks for taking time to leave this wonderful review too! Do you cook the beet first or put it in raw?? Hi Jessica! If you have a high powered blender, you can use it raw. See the blog post for cooking suggestions. I hope you enjoy the recipe! This sounds very interesting. …I’d like one to try this one as well. I’m new to beets, so I’m browsing for some recipes, but enjoy smoothies..
I’m so glad you enjoyed it, Michael! Thanks for taking the time to report back! Delicious! Used Trader Joe’s frozen beets which worked out really well. Thank you! Great tip, Tara! I’m so glad you enjoyed the smoothie! I made the smoothie today. I don’t love the taste of beet so I added a lemon. With the lemon added, I’m sure I will enjoy this smoothie weekly. Thanks for sharing!! Thanks for reporting back, Yvonne! I’m glad you enjoyed this! So I’ve tried your pineapple kale smoothie recipe and ABSOLUTELY loved it!! So I looked into other recipes and found this beet smoothie, I went to get the ingredients and ended up getting regular yogurt instead of Greek, omitted the yogurt and added everything else and it was AMAZING! Thank you! Hooray! I’m glad you enjoyed it, Daniel. Thanks for taking the time to report back! Joyce, I am so pleased to hear it. THANK YOU! This is now my favorite beet smoothie!! I added vanilla extract in place of the honey (about a teaspoon) and added two handfuls of lamb’s lettuce to get some leafy goodness in there. Thanks so much for sharing this! Thanks for sharing your tweaks, Elisa! I’m glad you enjoyed it!